How to Choose a Perfect Photography Website Theme? Any photographer, designer or any creative person/s need a beautiful interactive theme for their website. In that context WordPress themes are considered to be the best in the world of designs and aesthetics. Your website is the identity of your business. As far as photographers are considered, WordPress themes are very good because they have the potency to convert visitors into clients by showing off the work of the photographers in a good light. Moreover these themes are super easy to install, customize and put in great content within no time. Look at Bow Photography WordPress Theme, for example, which is ideal to promote your portfolio in an extremely professional and nice way. What qualities you should look for choosing a photography website theme? Let’s see. A big mistake most photographers make is choosing a bit more creative theme for their website. Remember that the WordPress theme you choose should make your images look the most beautiful without outshining them. It won’t do any good for your business if the visitors’ attention is drawn more towards the theme than your photos. It is essential that your website should look outstanding but it should not overpower your art. It is critical to choose a website theme which would make easy to implement your earning strategy. Though most websites apply multiple ways to earn, there is more emphasis on only one of them. E.g. if you want to promote your photography service primarily, your theme should serve more like a portfolio, while if you want to sell digital downloads or prints on a primary basis, you will need a theme which can administer your online storefront and incorporate your payment processor easily. Yours being a photography website, it will be extremely image intensive. Therefore you should choose a WordPress theme which is as light as possible, in order to keep the loading time minimum and also to make it less resource intensive for your server. Other than that, you should also keenly see how it manages images. Some themes are infamous for managing images poorly. It’s also another point to consider that even though you choose a lightweight theme, your website may load quite slowly if it is not able to manage your image efficiently. Lastly it is critical to select a responsive WordPress theme. The only guaranteed way to display your photos correctly across all the mobile gadgets that people will use to visit your website is choosing a responsive theme. Since the popularity of visiting websites trough mobile gadgets continues to grow it is advisable to expect the share of traffic to your website from mobile gadgets to keep growing over time. Bow Photography WordPress Theme passes most of these criteria successfully. It is extremely responsive, has stunning looks on every type of screen and gadget, comes in three variations making it easy for you to customize and is loaded with features. 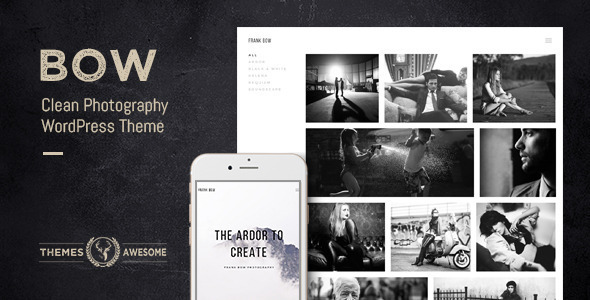 Choose such a WordPress photography theme and see your business growing. Comments Off on How to Choose a Perfect Photography Website Theme?